Today I am sharing a card that one of my team members, Margaret Galvez made that I call the Crosses of Hope Handmade card. I absolutely love the Stampin’ Up! 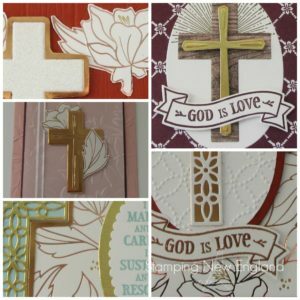 Hold on to Hope stamp set and Crosses of Hope Framelits. This is such a beautiful set with fantastic dies to compliment the stamp set. These crosses are perfect to make Easter cards, Sympathy cards, Confirmation or Baptism cards. I love the detail of the dies. So one of my Team Members on the Stamping New England Team designed 5 beautiful cards using the Sale-a-bration DSP – Springtime Foils Specialty Designer Series Paper and this stamp bundle. This DSP has several sheets of embossed lilies and other spring flowers that are very commonly used for Easter. The designs on the paper are embossed with Silver, Gold and Copper. I have pulled together a PDF with the details for making these gorgeous cards! This beautiful card uses Blushing Bride and Rich Razzleberry cardstock with Cardstock Vellum. 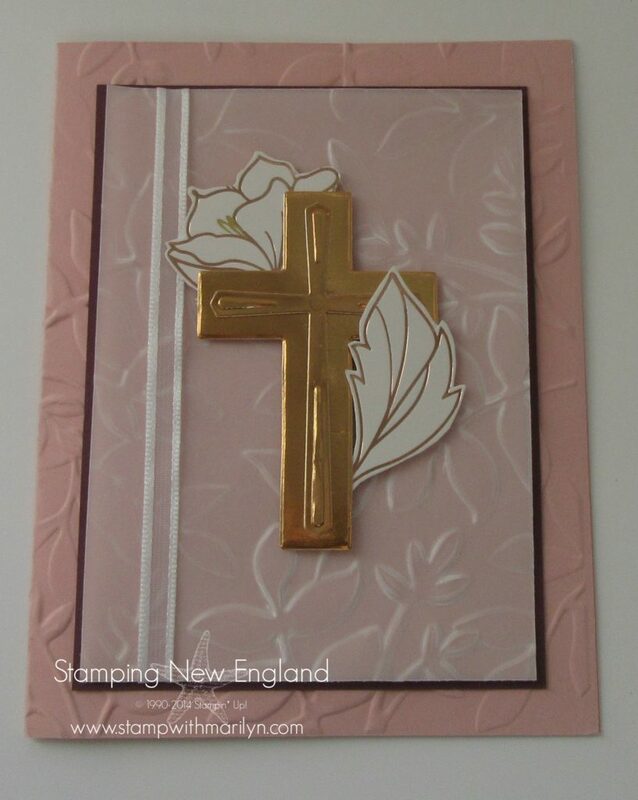 The Narrow Cross and Wide Cross are cut from Copper Foil Cardstock and layered together. 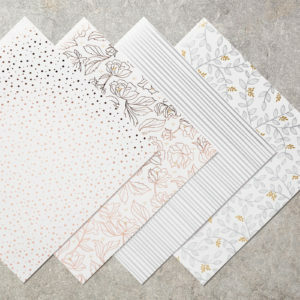 Both the Vellum and Blushing Bride cardstock base are embossed with the Layered Leaves Embossing Folder. I love the look of embossed vellum as the image turns a little white around the embossed image. The embossed vellum is layered onto a piece of Blushing Bride cardstock and then on a slightly larger piece of Rich Razzleberry cardstock. A White Organza ribbon is wrapped around this layer. Next a lily and leaf are cut from the Springtime Foil Specialty Designer paper that is one of the new Sale-a-bration items. This paper is absolutely gorgeous! So are you interested in the detailed instructions for these these beautiful cards? I have assembled a PDF with full color directions to make 5 beautiful cards using the Hold on to Hope bundle with the Springtime Foils Specialty Designer paper. These cards also use Gold and Copper Foil. You can purchase the full color instructions for just $9.95 through Paypal. Thank you for stopping by today and checking out my cards. These cards will be featured at my Class this Friday. 10am to 3pm during the day or 7pm for nighttime. Mark Your Calendars! June Creative Crafter’s Escape!